Sonatina : for oboe (or violin) and piano / Margaret Sutherland. Instrumentation: Violin (or oboe), piano. Difficulty: Medium — Violin version is on AMEB grade 6 syllabus. Duration: 6 mins, 46 sec. I. Gaily rhythmic -- II. Singingly -- III. Lively and teasing. Originally published by Kurrajong Press. CD: Spirit dances / Marina Marsden, violin, and Clemens Leske, piano. 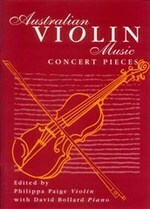 Score & Part: Australian violin music : concert pieces / edited by Philippa Paige, violin, with David Bollard, piano. 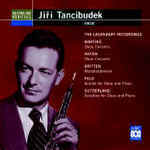 CD: Jiri Tancibudek, the landmark recordings.